Pleasant Living: Birthday Bashes and All That Flashes! Birthday Bashes and All That Flashes! 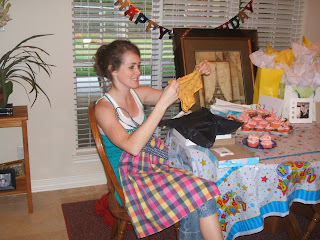 Yesterday was my new sister-in-law's birthday. She turned the dreadful age of 25. I, too, am 25, and I just keeping thinking, "GEEZ! A quarter of a century? Where has the time gone?" I'm getting too old, too fast. And, I even found a gray hair the other day, and I've been fighting off the crow's feet for years. Anyway, my vanity is a whole other post, so on with the story. Brian and I have the convenience of having all of our immediate family right here in the same town. I know, I know, we're so lucky. But, here's the problem, when your family is only a stone's throw away, you tend to take them for granted, rather than setting aside intentional time to spend with them. 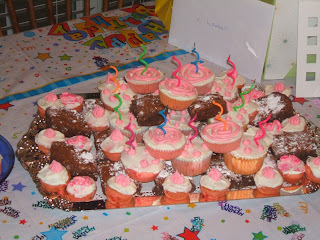 However, the birthday extravaganzas always envoke a sense of nostalgia and specialty in me. I love celebrations! I love any reason to decorate. This particular bash was at my in-laws house. Aren't these cupcakes cute? My sister-in-law (not the birthday girl) made them, and she even made one for each of our dogs. She is the cutest! Here's Lauren, the birthday girl and bride-to-be. She's getting married in August. And, here are some onlookers. 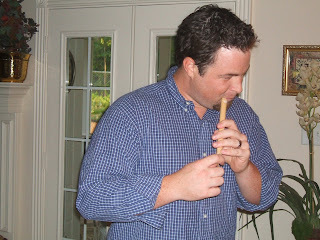 Yes, Brian is still a little Whistlin' Dixie, or Pied Piper, as he referred to himself. 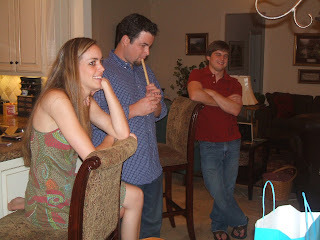 Also pictured is Erin, my sister-in-law who made the yummy cupcakes, and Josh, Lauren's fiance. I'm always interested in ways to make birthday parties for adults fun. Too many times, we kind of lose our gusto as the years creep by. What do you do to make adult birthdays a true bash? what fun pictures! i LOVE to throw any sort of a party and find any reason to celebrate. we don't really do anything too crazy...just usually have lots of fellowship, food, and play cards! My girlfriend is having a "Naked Lady Birthday party/ sleep Over" I at first thought it was a joke. But she did explain it. It gets its name because it was started out that you wore and outfit to trade and brought things to trade. She has asked us to keep our clothes on But to bring items to swap. Anything not taken will go in a donation pile for goodwill. I am trying to think of some "odd items" to bring, That is just who I am. It's hard once you have kids but it always includes lots of friends and food! And wine. We don't really do anything fun for birthdays, I guess. Just a pick what you want for dinner and same with desert. My Glenn is still at kid at heart too..and I love him that way! If we can't have fun and laugh..then life would be way too boring. How fun! My husband would also be blowing a whistle if he could get his hands on one!